Almost each one of us has spent hours yawning and sometimes sleeping over our history books in our school days, pulling our hair in frustration when trying to prepare the lessons for tests. Little did we realise then, the beauty of history in connecting us to our roots and leave us in wonder from where we have traveled to reach where we are today and the fascinating stories and legends that mark the journey. And it’s all the more wondrous when you know the place, where you are living, has been the playground of historical events to unfold. Just 40 kms from Chandigarh, in a sleepy village in Fatehgarh Sahib, Sanghol, you come face-to-face with your own historical roots. The village dates back to Harrapan times and has been the witness to the ups and downs of time since then. LOCATION: Sanghol is located in Khamano block of Fatehgarh Sahib district on Chandigarh-Ludhiana highway. It is also called ‘Uchha Pind’. Situated on the top of a mound, Ucha Pind Sanghol is spread over an area of 200 km. The ancient site of Harrappan culture is being maintained by the Archaeological Survey of India. 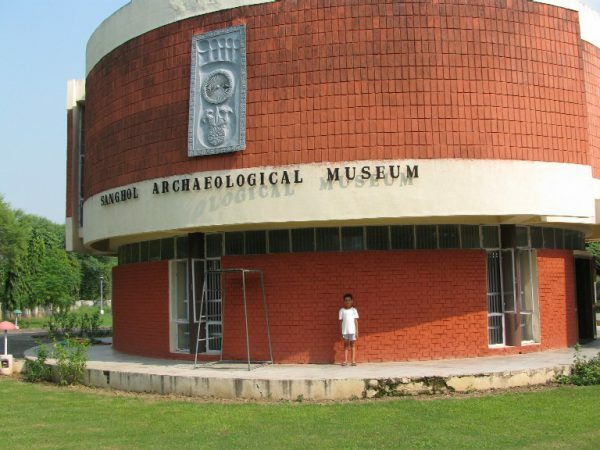 The Sanghol Museum, inaugurated in 1990, houses more than 15000 incredible relics and artefacts excavated from the village. You will find all the familiar names together at one place itself. The antiquities trace the footprints back to Harappan times (C.2000- B.C. 1200) to Mauryas, Sungas, Guptas, Kushans, Muslim dynasties of Medieval times, Mughals to present day. Even Sanghol’s connection to Central Asia has been established with the finding of coins and seals from their ancient times empires. The star attraction of Sanghol is the Buddhist stupa and monastery. Dating back to 1st and 2nd century AD, they are situated on the main road. [ngg_images source=”galleries” container_ids=”26″ exclusions=”406″ sortorder=”407,417,405,408,409,410,416,418,419,420,421,406″ display_type=”photocrati-nextgen_basic_slideshow” gallery_width=”792″ gallery_height=”514″ cycle_effect=”shuffle” cycle_interval=”1″ show_thumbnail_link=”1″ thumbnail_link_text=”[Show thumbnails]” order_by=”sortorder” order_direction=”ASC” returns=”included” maximum_entity_count=”500″]The gorgeous sculptures found here are exquisite examples of sculptural expression, and they have been on view at the Festival of India Celebrations in America and other parts of the world. [ngg_images source=”galleries” container_ids=”27″ display_type=”photocrati-nextgen_basic_slideshow” gallery_width=”792″ gallery_height=”514″ cycle_effect=”shuffle” cycle_interval=”1″ show_thumbnail_link=”1″ thumbnail_link_text=”[Show thumbnails]” order_by=”sortorder” order_direction=”ASC” returns=”included” maximum_entity_count=”500″]The art of Punjab is not usually referred to by scholars as a distinctive regional expression due to the paucity of sufficient materials. However, the discovery of Sanghol sculptures together with the huge Buddhistic establishment has opened up a new dimension. Punjab now claims a distinctive contributory role in the cultural creativity in the visual arts even during the early centuries of the Christian era. The glory of the artistic participation of Punjab in the mainstream of Indian cultural efflorescence is evidenced by the archaeological discoveries of Sanghol. History lover or not, do visit Sanghol just to appreciate the journey we have traveled over millennia. Next articleWhy is Chandigarh NOT in Top 10 Cleanest Cities in Swachh Survekshan-2017?